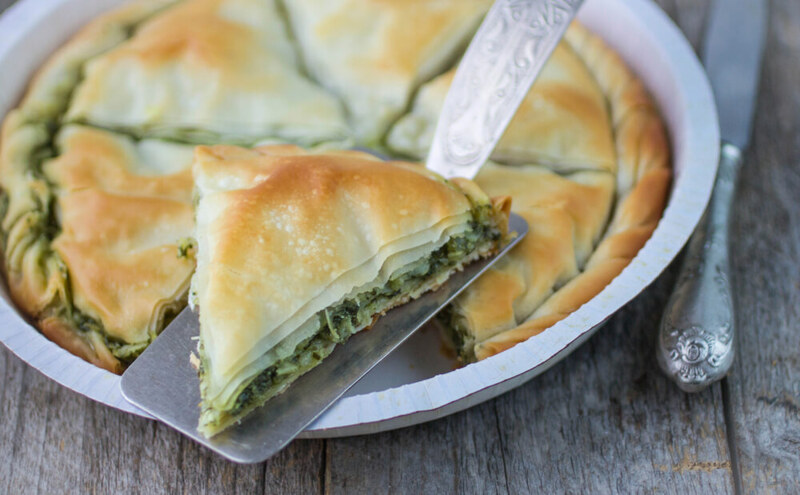 This spinach and cheese pie is similar to spanakopita but much easier to prepare and you only need a few ingredients to make it. 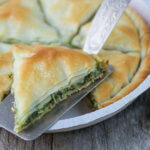 As well as the spinach and cheese, you need sun-dried tomatoes, filo pastry and a couple of eggs. Throw in some cooked chicken breast if you want to add something more to the taste, or just make it as it is and enjoy the simple spinach and cheese flavours. Serve this warm, in slices, with some salad on the side. It makes a great lunch or dinner. Not only do the sun-dried tomatoes add plenty of flavour and moisture, but the oil is used in between the sheets of filo pastry to give them a special taste. Wilt the spinach in a pan with 2 tablespoons of water, then let it cool in a sieve. Squeeze out the excess water and roughly chop it. Chop the tomatoes and combine them in a bowl with the eggs, feta and spinach. Unroll the pastry and cover it with some damp paper towels so it doesn't dry out. Brush one sheet of pastry with some of the oil from the sun-dried tomatoes. Now drape it over a 22cm loose-bottomed cake pan, greased side down, so some hangs over the side. Brush oil on another sheet of pastry and put that a bit further around. Repeat until you have 3 layers then spoon the spinach mixture into the middle. Gather the sides into the middle and scrunch them to cover the filling. Brush more oil on top.